Hey friends and family, how’s everybody doing back in the Golden State? Life is good here in Zambia. I live with my host family lead by my tireless, single mother of 6 (we joke that I’m number 7) Dorothy Namuchenje. Presently it is Ya Dorothy and two of her children, Noice (pronounced Noisy) and Tasa, as the rest have left the nest. I am finding the work incredibly challenging but rewarding. To my greatest surprise, my biggest challenge has been in finding ways to make an impact. My primary job as a fish farming promoter is not a full time job, so this has lead me to working in other fields (we started the Penza Primary School Tree Nursery!) including increased teaching and outreach at nearby schools. During my service I have seen the benefits completing schooling can have not only to an individual but to those around them. Unfortunately, once secondary school (8th grade) begins, school fees, boarding fees, and the opportunity cost of having a working age member of the family away can make secondary school a financial burden or impossibility to many families in rural Zambia. This has an outsized impact on young women within Zambia and around the world as available funds traditionally go to sons. So, upon returning from travels in January, it was bittersweet to meet Noice. She had been living with extended family in Livingstone as they were able to better support her living and educational costs. However, she missed her home and, especially, her mother whom she hadn’t seen in over 3 years. She was elated to be back and speaking Mambwe but her family in Livingstone was unable to support her from afar. That brings us to the point of this here business. I was determined to find a solution and had the means to support her in the short term at a local secondary school where I teach. If she was not enrolled in the 8th grade within the first few weeks she would have to redo the 7th grade the following year which can be a death sentence to a student’s completion prospects. Luckily the school’s headteacher, Mr. Peter Chewe, welcomed her, expedited the process, and told me I could pay at a later time. A fellow volunteer referred me to this organization, Bakashana. Bakashana facilitates school sponsorships of young women at risk of failing to complete their secondary school. Founded by two former Peace Corps volunteers, they do an amazing amount of work and are currently helping 200 girls attend school. I am hoping, with your help, to add Noice to this list! Noice is a fun loving, motivated 16 year old hoping to attend Kawama Secondary School through the next five years to completion. She takes after her mother in never wasting a moment and I often catch her stealing a moment or two to read random English books or pamphlets she’s gotten her hands on. In teaching at Kawama I’ve been delighted to see her immediately making friends and she is without a doubt among the sharpest kids in her 8th grade class. As I observe my fellow volunteer teach English, I spot Noice usually muttering the answers beneath her breath and later make fun of her later for her “insonyi” or shyness. 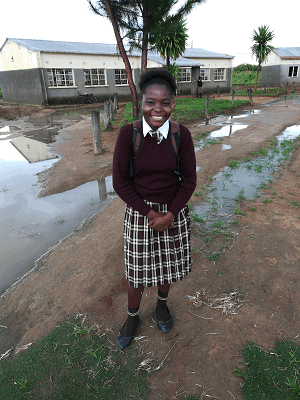 Upon graduating she would love to continue her education into nursing but qualifies this with “I don’t know, I’m only 16.” Noice Namuchuenje is a rockstar student and plans on breaking the pattern of women in her family ending education before secondary school, she just needs a little help. This sponsorship will cover her school fees, uniforms, and a weekly living stipend until her graduation in 2023. Anything helps and thanks for your interest!